“Umhlanga is a residential, commercial and resort town north of Durban on the coast of KwaZulu-Natal, South Africa. It is part of the eThekwini Metropolitan Municipality, created in 2000, which includes the greater Durban area. Commonly and erroneously pronounced (by residents and visitors alike) as Umshlanga (the correct pronunciation of “hl” in Umhlanga is similar to the Welsh “ll”), the name means “place of reeds” in isiZulu. 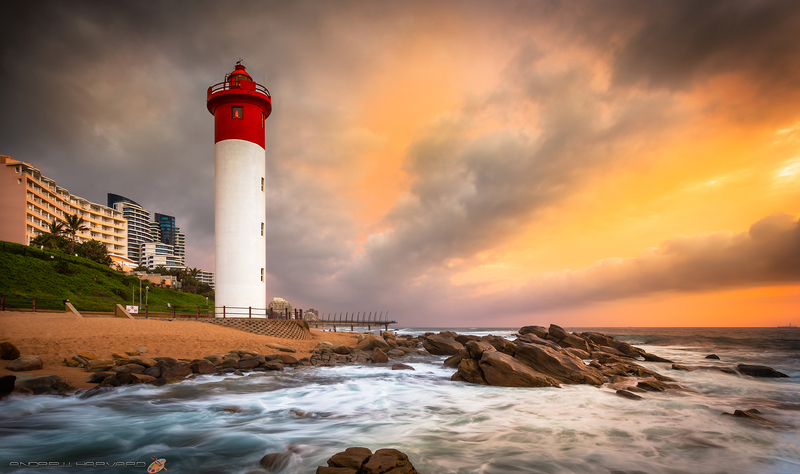 Umhlanga is named after the Ohlanga River, which reaches the Indian Ocean three kilometres north of the town. The Oyster Box, a luxury hotel since the 1930s, was originally built as a beach cottage in 1869, before the town had even been founded. In 1895, Sir Marshall Campbell founded Umhlanga. The town’s first hotel was established in 1920, followed by a shop, a lighthouse, the Natal Anti Shark Measures Board (today called the KwaZulu-Natal Sharks Board) and further hotel developments. The Borough of Umhlanga was formed in 1972 through the merger of Umhlanga Rocks, a seaside resort town, and the suburb of La Lucia. In the 1980s, development expanded inland. The Beverly Hills Hotel looks down onto the lighthouse and it a 5 Star Tsogo Sun establishment. That is stunning. Absolutely stunning!